We designed SpringBoard Math 2020 to focus on the same essential knowledge and skills that the Math sections of the SAT, PSAT/NMSQT, PSAT™ 10, and PSAT™ 8/9 assess. To be sure that we succeeded in aligning SpringBoard Math 2020 with the tests in the SAT Suite of Assessments, we plan to conduct an updated research study. The results of a former study showed strong to exemplary alignment1 between each SpringBoard Math 2014/2015 course and the corresponding SAT Suite test. This means that SpringBoard Math students are getting ready for the SAT, PSAT/NMSQT, PSAT 10, and PSAT 8/9 in the classroom every day. SpringBoard Math 2014 Course 2, Course 3, and Algebra 1 align to all 14 of the content dimensions in the three PSAT 8/9 domains. 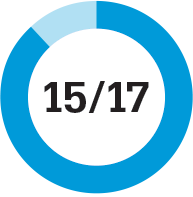 SpringBoard Math 2014/2015 Algebra 1 and Geometry align to 15 of the 17 content dimensions in the four PSAT 10 and PSAT/NMSQT domains. SpringBoard Math 2014/2015 Algebra 1, Geometry, and Algebra 2 align to all 19 of the 20 content dimensions in the four SAT domains. LIMITED alignment occurs when more than one content dimension in a domain is not addressed in the SpringBoard course/assessment. STRONG alignment occurs when all but one of the content dimensions in the domain are addressed multiple times throughout the SpringBoard course/assessment. EXEMPLARY alignment occurs when each content dimension in a domain is addressed multiple times throughout the SpringBoard course/assessment. 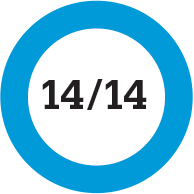 1 An alignment is identified when any portion of the SpringBoard curriculum includes direct instruction or assessment of a content dimension from the SAT Suite of Assessments. 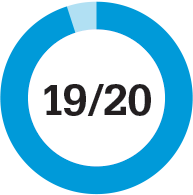 One content dimension (Percentages) in the domain of Problem Solving and Data Analysis is addressed in SpringBoard courses preceding Algebra 1. Two content dimensions (Percentages and Ratios, Rates, Proportional Relationships, and Units) in the domain of Problem Solving and Data Analysis are addressed in SpringBoard courses preceding Algebra 1.